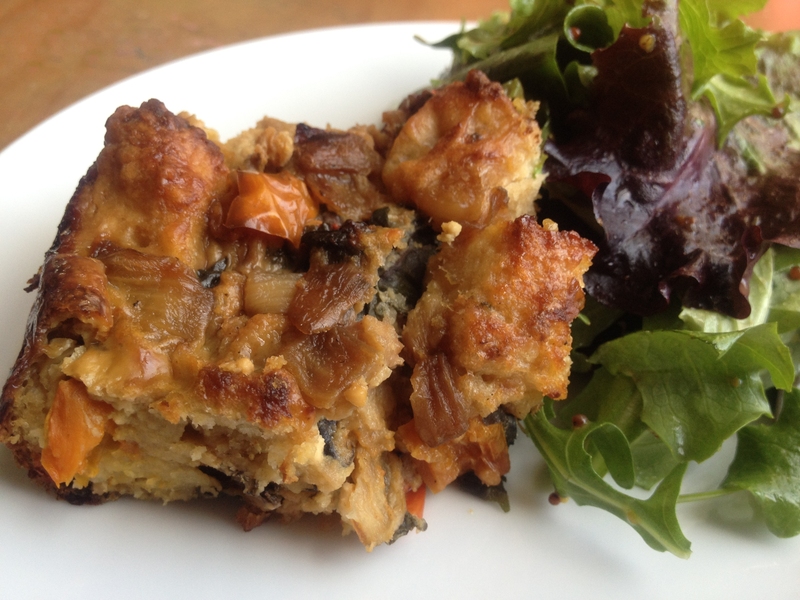 I love savory bread puddings for so many reasons. This one is packed full of vegetables and has all four food groups in one baking dish (you know how I love a casserole). You can make it ahead of time and have it cooling on your stovetop when your brunch guests arrive. The texture contrast between the crisp browned top and the savory custard within is lovely. And it’s a thrifty way to use up bread that’s past its prime. Actually, let’s just call that bread that’s in its bread pudding prime. This is not a terribly pudding-y bread pudding. It’s hearty fare, not a delicately quivering cream custard (those make good bread puddings too, but you’ll need a different recipe for that). As always, you can vary the ingredients here, but I think the essential thing is to make sure that the eggs and vegetables are well-seasoned with salt and pepper and/or herbs, since a plain bread adds more texture than flavor to the finished dish. (Or you can use your leftover beer bread, as I did, or another strongly-flavored bread, in which case it adds a flavor of its own.) This Savory Bread Pudding starts with what I think of as caramelized onions for cheaters: saute one or two diced onions in a wide pan over high heat with a diced sweet pepper and a few pinches of salt, stirring often, until the onions are well browned. Continuing to stir frequently, add 8 oz. sliced mushrooms and allow them to release their liquid and brown as well. Add a few big handfuls of chard leaves cut into ribbons, stir just until wilted, then remove from heat, taste, and add more salt if needed. In a large bowl, whisk 8 eggs with 2 c. milk and season generously with salt and freshly cracked coarse black pepper. Stir in 8 c. of 1″ bread cubes, the cooked vegetables, some halved little tomatoes, and a few big handfuls of crumbled feta cheese. Mix well, then scrape the egg mixture into an oiled 9×13 baking dish. Bake at 375 for about an hour, covered with aluminum foil (oil the underside to keep it from sticking). Uncover the bread pudding when it is mostly cooked and turn on the broiler for a few minutes (without moving the pan higher up in the oven) to set the top. I served mine with a green salad dressed with equal parts coarse mustard, honey, white vinegar, and olive oil. This entry was posted in Breakfast, Easily Multiplies to Feed a Crowd, Eggs, Feeding Kids and tagged baking, bread, breakfast, brunch, children, cooking, dinner, DIY, eggs, family, food, homemade, kids, lifestyle, recipes, vegetarian on March 23, 2012 by emmycooks. We do something like this in work – it always looks great. this must work very well. Nice–let me know if you come across any favorite variations! We go to friends every Easter and share a meal with a large crowd. Everyone brings something and I think this sounds like a crowd pleaser. This is a great take-along dish because it’s good at room temperature as well as hot. And for Easter you could go with springtime veggies–like asparagus and Gruyere cheese, yum! I find that when I make my own bread I am often looking for ways to use it up (since it’s not full of preservatives and I hate for it to go to waste!). This is definitely a worthy destination for aging bread. :) And as good for lunch or dinner as breakfast, of course! Looks totally veganizable (new word??). Yep. That recipe is awesome. It has some cheese in it, but the onions and chard are super silky on their own, and you’ll get the crouton-y browned top–as long as you have a well-seasoned, flavorful broth, I think it would be great without the cheese. It’s basically just a dense bread soup. You keep giving me new ideas for vegetables that come in abundance from our CSA. Thanks! I’m not too shy about putting my guests to work either! I prefer not to, but if that’s what it takes to get the meal on the table, so be it. Besides, I find people usually want to help out with something and, as you said, it adds to the fun and camaraderie.